Have you ever thought that the simple but interesting word GET could be used in many different ways? Welcome to another English speaking lesson to improve your English communication skills. In this Spoken English lesson, you would learn some cool English phrases and expressions with the word GET. 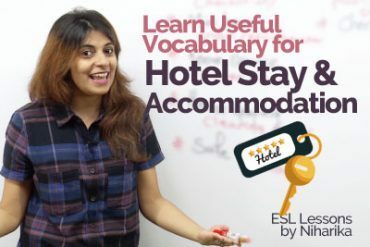 The English language is always expanding and filled with surprises, this English lesson with Michelle is a good example to understand the different meanings of the word GET. This spoken English lesson is brought to you by Let’s Talk English Speaking Institute Mumbai, where you learn English online for free. 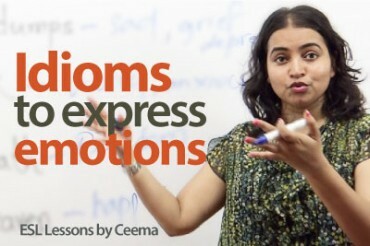 Watch our library of more than 1200 free English lessons and improve your English communication skills. Example – Come on, Get a life, you can’t be cleaning the house on a Saturday night. Example – Anna asked him to get lost after he turned late for the date. Example – Peter please move on we don’t have the whole day to clean the house. Example – We had enough conversation about the product details, now let’s get to the point. Example – Who says girls can’t go partying late night, get with it. Example – Mike get the lead out and show us what you have. Get me a glass of water quickly. What do we mean by the word, get? By get, we mean we are asking for something or we are receiving something but do you know that get can have a different meaning other than its literal meaning? Yes, it can, keep watching this lesson with me, Michelle to find out the different meanings for our interesting get. Let’s look at the first expression that we have. Get real, obviously, this expression will be used for a person who is not so realistic or maybe who is imagining a lot of things, which are not true. So, I have this friend who is a bit short and she wants to be a model. She wants to win a beauty pageant and I told her, get real. It’s not possible for you coz you need to be at least 5’8″ to be a model or to win a beauty pageant. So she’s just imagining things in her head. So obviously as you must have guessed, I cannot say this statement to someone I’ve met for the first time coz it’s slightly rude. So please refrain from using it with strangers and you can use it freely with your friends. So for someone who is being too imaginative? Alright, let’s look at the next one, get a life. This has a similar meaning like get real. Nobody’s dead, it’s not like you’re telling a dead person to get a life coz that is just not possible. So it has an idiomatic meaning which means a hidden meaning that you need to understand. So get a life is a stronger statement and a bit ruder than get real. This would be used for a person who is very boring. Possibly a person who wants to spend their Saturday night cleaning the house. That’s so boring, isn’t it? And I am sure if you have a friend like that, you would want them to go out and do something exciting. So I have a friend, Hannah and I spoke to her last weekend. It was Saturday evening and I said, “What are you doing this evening?” she said, “I’m cleaning the house.” I told her, get a life. Go out, have fun. This means that do something interesting and you usually use this for a person who is very boring or who is acting boring. To do something exciting. There are many more expressions that you can have with get. You can express that you want someone to do something. Not only that, you can also express your anger when you ask someone to get lost. Do you think they are gonna get lost and never see you again? Possibly that’s not gonna happen but again you can use this with your friend when you want to express your anger and you are really irritated. So maybe at the end of an argument with your friend. It could be a small argument but you can use this phrase, get lost as long as you are sure they will not be offended coz I know people who get really offended by the use of get lost. If someone tells me that, I’d be really offended. So be careful with the use of this phrase. You use it when you are very angry and here you are asking that person to never show their face again but you don’t mean it literally, it’s just for the moment. Let’s look at the next phrase that we have. Get a move on. So you’re asking someone to move on which means to increase their speed. Who would you ask to increase their speed? Naturally, someone who is very slow. So get a move on, in other words, means hurry up. Hurry up, has it ever happened that you asked your husband to clean the house with you and he’s just lazing and doodling around. He’s just not moving. You could tell him, get a move on, we don’t have all day to clean the house. Let’s look at the next phrase. Oh before that, let’s also look at this phrase. Get a move on and get the lead out. What do I mean by, get the lead out? It has a similar meaning like get a move on but again it’s a stronger term. So this could be used when you are really irritated and someone is just not you know hurrying up. For example, you are in a meeting or yeah in a meeting and you have this colleague who is really slow when they speak. He’s a very slow talker, although he’s a good friend as well. So this person is doing a presentation and he’s just going on and on and on and on and he’s not even coming to the point. So you could tell him, come on Mike get the lead out and tell us what you need to say. Get to the point. So this also means, hurry up but when you are really impatient and when you are very irritated. When you are very irritated. Let’s also talk about the origin of this phrase, get the lead out. As you’ve heard, lead is a metal and it’s the heaviest metal for those of you don’t know and so you are asking someone to get that heaviest metal off so that they can increase their speed. Sometimes you’ll also use it like get the lead out of your pants kids and get going. So you can also use it in that way. Let’s look at the next one that we have. Get to the point. So as I told you, if you have a friend like Mike like my friend Mike who’s a slow talker and who just can’t get the lead out, you could tell him, get to the, point because he’s been beating around the bush. He’s not talking about what he must talk. so he’s given a lot of small talks and he’s talking about a lot of unimportant things but he’s not getting to the point which means get to the main topic of your conversation. Get to the main topic. So here we have get to the point for you. For me to get to the point, let’s look at the next phrase, get with it.so, this phrase has a similar meaning like get real or get a life. Get with it means just get with the attitude. It’s like reprimanding someone which means that you’re being angry and you’re telling someone with some anger to change their attitude. So if someone tells you that you shouldn’t go out at night because you’re a girl, you might tell him or her, get with it just get done with your attitude. Gone are the days when women couldn’t go out because it’s late at night. If you can handle yourself at night and if you can manage your own safety, it’s perfectly okay. So get with it means to change your attitude and definitely, it is the harsher term than get real or get a life. So these are some interesting phrases with get. I’m going to do a quick revision for you so that you don’t forget these expressions. the first one, get real is used for someone who is being too imaginative and if they are 5 feet tall and they want to win a beauty pageant then I’m sorry, you need to get real. Maybe you want to try some other field. Maybe you are talented and you are better at something else. The second one, get a life which means to do something exciting and not laze around and just be bored on a weekend. The third one, get lost, that’s really angry and very offensive, very, very rude, be careful with its use. Get a move on means hurry up. Get the lead out, the heavy metal out and start doing your work quickly. Get to the point means stop beating around the bush, stop your small talks and talk about the most important topic of your conversation and the last one, to get with it means to change your attitude and to stop thinking in a particular way. Thank you so much for staying with me. I had a great time teaching you. Please come back for more lessons with me, bye-bye. Previous Previous post: 5 Surefire ways to double-up your confidence level.